Carbrooke Mill Drift postmill was built c.1837 to replace the earlier postmill that had been blown down in 1836. The mill had a roundhouse from which the bricks were later used to repair nearby Breckles Hall. 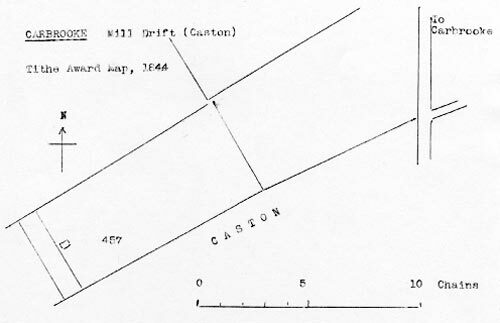 The mill stood to north of Northacre just outside the Caston boundary and actually within the parish of Carbrooke. 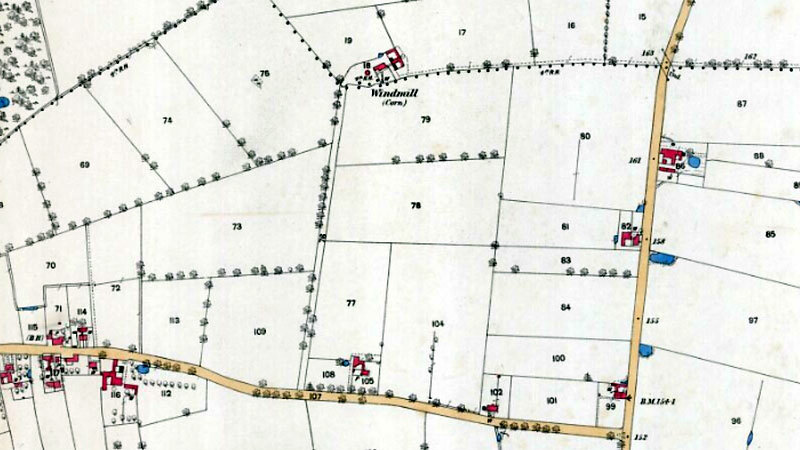 It was approached from Northacre by the lane to the west of Foxhall Farm and from the Carbrooke Road by the track running westwards along the Caston/Carbrooke boundary, the entrance being opposite the track leading eastwards to the former Rockland Gap Farm. The mill was demolished long ago and indeed nobody can now remember it. The brickwork (presumably a roundhouse) survived longer than the mill itself and the bricks were sold and used in the repair of Breckles Hall by Mr. Hanbury. The adjacent Mill House was occupied by Mr. and Mrs. George Freston until about 1953 and has recently been demolished. The site has become part of a field. All the valuable Live & Dead FARMING STOCK & Effects of Mr. Atmore jun. who is leaving England. Household Furniture, Live & Dead FARMING STOCK & Effects of Mr. Edward Atmore jun. who is leaving England. Household Furniture, Live & Dead FARMING STOCK, Miller's Cart & Effects of Mr. Edward Atmore jun. who is leaving England.